Prior to his accession to the British throne in 1821, King George IV served as Prince Regent of the nation during the mental illness and incapacitation of his father, George III. The prince led an extravagant lifestyle before and during his regency that held great sway over the fashions of the day, and he advocated new forms of leisure, style, and taste. During this period, he built the famous Royal Pavilion in Brighton, which was an Orientalist fantasy in architecture. As with the pavilion, the “Regency Style” that the prince created was a mixture of the Antique and the exotic, the gilded and the decorated—and with an interest in elegant innovation. The Lavish Prince Regent presents a survey of this most sumptuous of historical styles. Rienzi’s exhibitions, presented biannually, explore elements of the house museum and 18th- and 19th-century European decorative arts in depth, actively engaging visitors in a dialogue with the Rienzi Collection. Free with Rienzi admission. 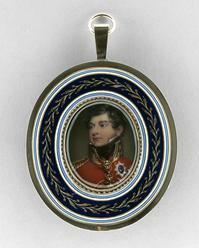 Christine Gervais discusses a miniature painting of George IV on view in the exhibition on 17th March and 21st April.